has been prepared by the Royal Institute of British Architects (RIBA) and this will be held during the month of April. 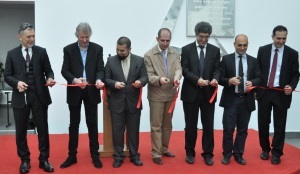 The opening of the “RIBA President’s Medals” exhibition, which was held in the GAU Techno Park Exhibition Hall and is held for the first time in the TRNC, was attended by GAU Founder Rector and Chancellor of the Board of Administrators – Serhat Akpınar, RIBA Training Director – Prof. Dr. David Gloster, GAU Vice-Rectors – Prof. Dr. Sadık Ülker, Assoc. Dr. Zafer Ağdelen and GAU Secretary General – Assist. 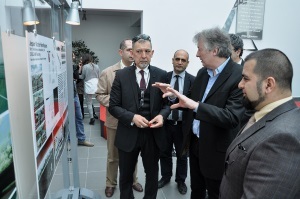 Dr. Sualp Davut, Vice Dean of the Architecture, Design and Fine Arts Faculty – Assist. Dr. Hossein Sadri, together with Lecturers and Students. Arts Faculty – Assist. Dr. Hossein Sadri thanked the GAU Administrators and the Director of RIBA for giving support by bringing the exhibition to Cyprus for the first time and conveyed his wishes to maximize the relations between the GAU Architecture Faculty and RIBA. RIBA Training Director – Prof. Dr. David Gloster thanked GAU for hosting an event with this significance and stated that necessary action will be taken in order to enable GAU Architecture – RIBA Education Department to be included in known schools. 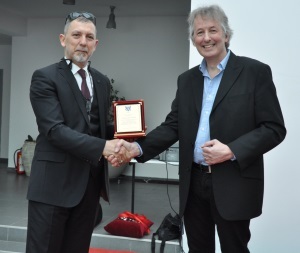 Rector and Chancellor of the Board of Administrators – Serhat Akpınar presenting a plaque of appreciation to the RIBA Training Director – Prof. Dr. David Gloster. Prof. Dr. David Gloster joined with the Lecturers and Students in the GAU Millenium Building Senate Congress Hall after the opening ceremony, and gave a presentation on the education activities of RIBA. According to the statement from the Girne American University (GAU) Architecture, Design and Fine Arts Faculty, the “RIBA President’s Medals” exhibition will be open to the public between the dates of 1st April and 1st May at the GAU Karmi Campus Techno Park Exhibition Hall. What’s New on BRT2 Television 05/04/2014 – Embargoed!